Tesla aficionados have another reason to celebrate. An 18-minute video shows human drives precisely what an Autopilot system sees in its full 360-degree VR glory. The video comes on the heels of Tesla owners achieving 1 billion miles driven on the Autopilot system over the course of three years and 500,000 cars, as of November 2018. The video is amazing. 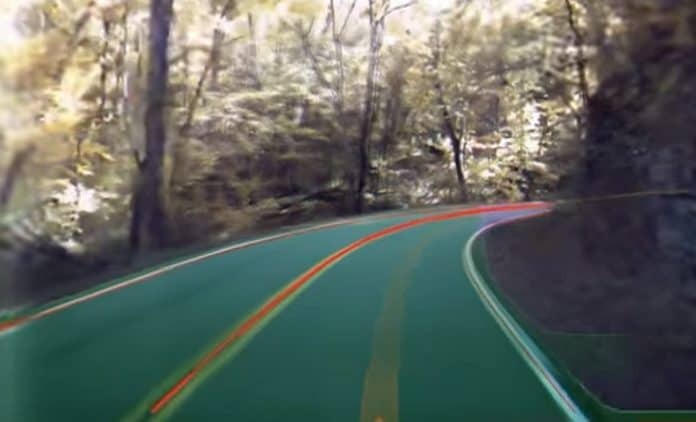 It gives you a car’s eye view of the Tail of the Dragon, a mountain road that winds through the Appalachian Mountains along the border of North Carolina and Tennessee. Viewers can click and drag the video from one side to the other. You can see the action from the front, sides or back of the car. The full 360-degree view combines all eight cameras used by the Tesla car along its journey. The video starts with a motorcycle behind the car. As the cycle gets closer, the Autopilot system outlines it in red. Nearly three minutes in, the Tesla owner pulls over for a few seconds and lets the motorcycle pass. Oncoming traffic also gets red rectangles/boxes around them. The road is outlined in green. A yellow stripe shows the path of the car in front of it. At five minutes in, Autopilot detects parked cars on the side of a scenic overlook. These vehicles get yellow rectangles/boxes. The car slows down to under 10 mph to navigate this area. After the car clears the congestion, it adeptly accelerates to 20 mph as it continues the trip. Another cool part of the video is the speed readout on the lower-right corner of the screen with the front-facing view. Keep an eye on speed limit signs and the yellow speed caution signs going into turns. This lets you see how well the Tesla maintains the speed limit for safety. Videos like these give drivers a sense of what Tesla cars are capable of when running on Autopilot. It also shows bits of data that goes into Tesla’s vaunted neural net. The more information the neural net collects, the better the Autopilot system becomes. Hopefully, the the custom AI chips that come out in Hardware 3.0, we’ll see many more improvements in Tesla’s Autopilot system.